With so many websites out there that connect freelancers and employers, you might find yourself not knowing where to look or which one is the best bet for you. Each website differs in the types of services they offer and the skills level of the freelancer – ranging from those just getting started to those at the top of your field. Other variations include the type of employer-freelancer relationship that the website serves, the length of the project (one-time project vs. the potential to get hired full time), and more. No matter what type, level or intensity of side work you’re looking for, we are here to help you sift through the plethora of options and give you a perfect starting point to a successful freelancing journey! Upwork is typically one of the top results you’ll see for any “freelance work” related Google search. As one of the most commonly used freelancing websites, UpWork has over 10 million registered freelancers, and over 4 million registered clients (those looking to hire), as well as 3 million jobs posted annually. While this might look like you’re up against some stiff competition, there are ways you can stand out on UpWork if you stick it out for a little while. Who It’s For: Pretty much anyone, even those who provide services that you may have never thought could be freelanced. There are the usual listings for graphic designers and content writers that you will see on most freelance websites, as well as the not so usual virtual assistants and HVAC system designers. There are numerous categories, so it’s worth a search on UpWork to see if there is a place for what you offer! How It Works: UpWork works in two ways – freelancers create a profile with information about themselves and their experience, and state an hourly rate. Employers are simultaneously posting projects that they’re hiring for. As a freelancer, you can submit a proposal to a job posting and also be sought out by employers. What Makes It Unique: Honestly, UpWork does not offer anything exceptionally unique from other freelancing websites. Which isn’t a bad thing – it’s straight forward in the way it works, and with a little time and elbow grease to build your credibility, you should have no problem getting additional freelance work with UpWork. Payment: Employers have the option of setting payments by hour or by project. When you’re browsing freelance jobs, you can sort by hourly pay or fixed pay if you have a preference for one or the other. For hourly projects, freelancers bill the employer once a week and the payment is sent from the employer through UpWork’s secure system, either by credit card, bank account, or PayPal. If you’re working on a fixed project, funds will be sent to you after you reach pre-determined milestones. When funds are sent to you from your employer, UpWork deducts and keeps 10% of the rate, and you keep the other 90% – not so bad! Things You Should Know: It might take you a bit of time to build up credibility and receive consistent work. Top rated profiles are shown first when employers are browsing freelancers, and these freelancers also receive proposal invitations that others do not. Toptal is one of the more serious freelancing websites out there, in that freelancers need to apply and be accepted to use the website, and only 3% of applicants are accepted. The potential of Toptal goes beyond hourly freelancing and into part-time and full-time positions – this is not the casual work that some freelancers are looking for, but it could be the perfect fit for those who are trying to use side work as a way to gain further experience and work their way up. How It Works: Toptal boasts hiring the top 3% of freelance talent – they claim to receive thousands of applications a month, only accepting 3% or fewer. This competitive atmosphere can make the site a tough one to be a part of, but it’s worth a shot to apply. Plus, if you’re chosen, you have the potential to have some pretty ample projects headed your way like J.P. Morgan, AirBnB, Gucci, and Pfizer, just to name a few on the list of major companies who have used Toptal’s services. Unlike UpWork, Toptal only works one way – it connects employers to freelancers, but freelancers are not able to seek out open positions or projects. Once you apply and get accepted by Toptal, you’ll be able to create a profile that looks much like a resume, giving detailed information about your prior work history. Toptal receives information from employers about the projects they need freelancers for, and then recommends the freelancers that they think would be best suited. What Makes It Unique: The fact that you need to get accepted to Toptal is the main characteristic setting it aside from other freelancing sites that tend to allow freelancers of all skill levels to create a profile and start applying for work. While this makes it more difficult to use (since you may or may not be able to at all) the benefits can be numerous if you do make it in. Top companies are looking for talent on here, meaning opportunities for great experience, substantial pay, and the potential for full-time work. Payment: Freelancer rates are not explicitly stated on their profiles, and employers that are hiring do not post projects. So, there is nothing that can be seen in terms of payment right of the bat. Rather, payment information comes later in the process, after a freelancer is approached by Toptal as a potential candidate for a position. Things You Should Know: When an employer hires a freelancer, they are entered into a trial period, wherein the employer has the opportunity to decide if the freelancer is meeting their needs or not – if they are not, they can choose discontinue their relationship with the freelancer, risk free. Don’t feel overly secure with your new side gig until this period of time is complete! Freelancer advertises themselves as the “world’s largest freelancing and crowdsourcing marketplace,” connecting of 19 million employers and freelancers. That’s a lot! The concept of Freelancer is simple, and anyone can join and start bidding on projects. It has a competitively driven edge to it as well (more on that to come), that provides freelancers that are just getting started with a good way to start building a portfolio. Who It’s Good For: Freelancer accommodates a wide range of skill sets. On their homepage, they advertise Web Development, Web Design, SEO Marketing and Mobile App Development as their main categories. But if you dig deeper, you’ll find a plethora of more specific categories within these broad groups, as well as several additional categories such as Data Entry, Accounting and Translation. How It Works: We’re back to the two way street with Freelancer – employers will post projects, and can either browse freelancers and reach out to ones that they’re interested in, while also accepting applications from freelancers that are interested in their project. Employers also have the option to hold “contests,” wherein a bunch of freelancers complete the task at hand and submit the final work to the employer, and the employers only pays for the ones they like. What Makes It Unique: In addition to accommodating digitally based freelancing services like most freelancing websites, Freelancer also connects freelancers with employers locally to fill jobs that need to be done in person such as roofing, painting, and other home improvement. Milestone Payments – the employer sets “milestones,” or goals for freelancers to meet in order to receive payment. This could be the completion of the entire task, or at various points throughout the project. Transfer Funds – payment is transferred directly from the employer to the freelancer. Invoices – for hourly projects, invoices are automatically generated based on how may hours the freelancer works on a project (tracked with Freelancer’s desktop app). Once you are paid in one of these three ways, you’ll see your awarded funds in your Freelancer account. Funds can then be withdrawn through PayPal, your bank account, a Skrill.com account, or a Freelancer debit card. Things You Should Know: There are several upgrades that freelancers can make when it comes to their membership plan. You can stick with the free plan, which allows freelancers to apply to 8 jobs per month. For $1.99 per month, you can apply to 20 jobs along with a list of other benefits, all the way up to the Premier plan for $49.95 per month. Make sure the side money is flowing it before you make any crazy upgrades! Fiverr has a different feel than the other freelancing sites on this list. It feels more like the Etsy of freelancing websites as opposed to the LinkedIn of freelancing websites like the others listed. Allow me to explain. Who It’s Good For: Anyone completing digitally-based services. In addition to digital marketing, graphic design, programming, and typical categories of online work, you’ll also find some niche areas like fortune telling and celebrity impersonators. How It Works: Instead of creating a personal profile that contains a photo of yourself and a list of your skills like most other freelancing sites, you instead advertise your service, referred to as a “gig.” So instead of seeing “John Smith – Web Designer” you’ll see a listing with a compelling statement like “I will design the website of your dreams” with a price. Once you click through, you will see the person who makes such a promise and detailed information about them as well as other gigs they have posted on Fiverr. From here, an employer can contact John to make that website that they’re dreaming of. Fiverr only works one way, allowing hirers to browse through services and contact freelancers. There is no way to post open jobs, or for freelancers to browse open positions. What Makes It Unique: Fiverr takes more of a marketplace approach to freelancing than the more professional, straight-laced feel of the other freelancing sites out there. If you browse around, you’ll find numerous gigs that cost only $5 and aren’t long-term or even restricted to the professional realm. For example, if I’m bored on a Wednesday night, I can go on Fiverr and get a physic reading, 4 hairstyles that are chosen for me and my life, and be coached through any problem, all for $15. (I promise those are all real listings). Freelancers also have the opportunity to offer their gig at different levels and pricing. Every different package option and what each includes is shown in an easy to read format on the gig’s listing for buyers to chose. Payment: Buyers can choose to pay by credit card, debit card, a prepaid gift card (through Visa, MasterCard, American Express or Discover), or PayPal. All sellers need to set up a PayPal account where they can withdraw funds after getting paid. Once a gig is purchased, and the service is delivered in full, the seller gets paid – sellers keep 80% of profits with Fiverr keeps the other 20%. Sellers are unable to withdraw money from their PayPal account until 14 days after the order is marked as complete. Sellers that are Top Rated, however, only need to wait 7 days to withdraw funds – more motivation to deliver a great service! Craigslist is definitely more of a free for all than any of the other websites on this list, but that’s why I felt like it should be added – to present the wide array of options out there for different styles of freelancing. Craigslist is not formal, but its lack of guidelines means you’ll never know what you’ll find; it could be the diamond in the freelancing rough that you’ve been looking for! Who It’s Good For: Freelancing positions on Craigslist are found in the “jobs” area of the site, meaning freelancing positions are mixed in among full-time and part-time positions. Just about every job category out there is listed on Craigslist, so no matter what you’re looking for, it’s worth a shot to find the most related category and skim through to see if there is a posting for the freelancing job that you have in mind. How It Works: While freelancers do have the option to create a posting offering their services in the most related job category, it is much more common to find employers posting an open position for freelancers to reply to. The whole process is very informal, and good judgment skills are needed in every stage of the process. You’ll need to make sure that the position and employer are legitimate as many of the postings can be very vague. Before you get started, it’s best to have a plan in mind to make sure that you do get paid, and when you are supposed to. What Makes It Unique: Minimal rules and guidelines. This can bring on challenges in terms of communication and security, especially when it comes to digital work, but there is a place for Craigslist in the freelancing realm. There are a lot of hirers out there that utilize Craigslist to fill positions since it has a large audience, and it’s quick to use due to it’s lack of frills (no long sign up process, no profile creation, etc.). It can also be especially useful for locally based jobs. Payment: With Craigslist, payment varies from listing to listing and needs to be discussed and agreed upon on the ends of both the freelancer and the employer before work begins. It could be anything from meeting up to pay in cash if the job is local, to PayPal payments, to a check in the mail, to a trade! Choose whichever option works for both of you, makes sense for the job, and that you are comfortable with. It’s important to remember that with Craigslist, there is no middleman website involved to secure payments and make guarantees to cover anything that goes awry. It is solely between freelancer and employer, so it is important to have a reliable plan in place regarding timelines and payment. If you choose to use Craigslist for freelancing work, it would be a good idea to utilize an invoicing service to streamline the billing process. An invoicing solution like Bill Flight handles the time tracking, reporting and invoice-sending steps so there are no discrepancies when it comes to the work completed and you getting paid. 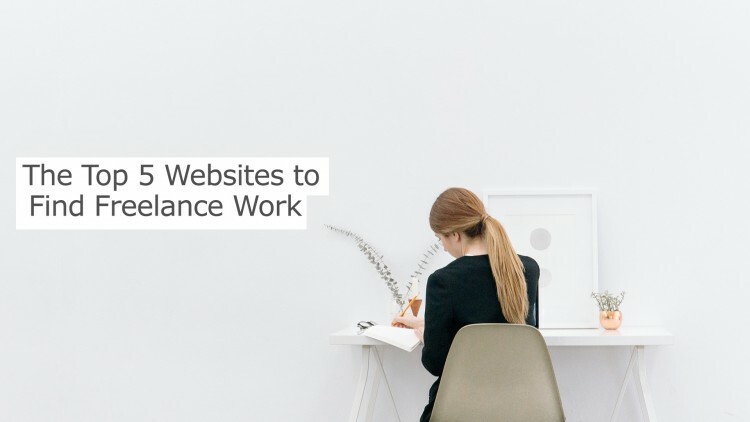 Hopefully this list of the top 5 freelancing websites saves you from the state of an anxiety and overwhelm that doing a Google search for freelancing websites may result in. Depending on your skill level, freelancing experience, and what type of service you offer, you will likely find success with a different website than the next guy or gal. That’s okay! Even if the first one you try isn’t a success, you’re at least going into the next one with more knowledge and understanding of what to look for. Pep talk concluded. Happy freelancing!